Good-Gums® is a new addition to your oral hygiene program for healthy gums. Despite brushing teeth and using dental floss and mouth rinses, many people do not have healthy gums (gums are often swollen, bleeding or receding). There are a number or reasons for this including bacterial infection, imperfect brushing/flossing, poor diet, and smoking. 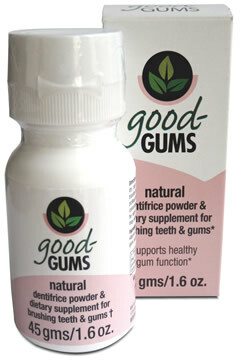 Good-Gums is a dental powder made from herbs and minerals that has been formulated to optimize gum health. Ingredients include baking soda, French grey sea salt, Vitamin C with bioflavanoids, myrrh, peppermint, tea tree, cinnamon and cranberry. Use Good-Gums after flossing by placing a small amount of powder (about a small pea’s worth) onto a damp toothbrush and brush your teeth in the normal dentist-recommended way, making sure that you also gently brush your gums and around your mouth, making sure that the powder (which will dissolve in your saliva) is evenly distributed. You can spit out any excess liquid but do not rinse as it is important that the Good-Gums ingredients are left in contact with the gums and teeth for as long as possible. Good-Gums is most effective when used as a toothpaste substitute, on its own. Although some people still like to brush their teeth with traditional toothpaste first before then using Good-Gums. Although this is totally unnecessary and somewhat counter-productive. The reason it is a powder is that dry ingredients do not need preservatives, which makes Good-Gums preservative-free. In addition to this, Good-Gums is not tested on animals and contains no artificial colors or flavors, no harsh abrasives and no fluoride. Good-Gums is available in 45g tub which should last around a month and a half to two months.